Koninklijke Philips N.V. (Royal Philips, commonly known as Philips) is a Dutch technology company headquartered in Amsterdam with primary divisions focused in the areas of electronics, healthcare and lighting. It was founded in Eindhoven in 1891 by Gerard Philips and his father Frederik. It is one of the largest electronics companies in the world and employs around 105,000 people across more than 60 countries. Philips is organized into three main divisions: Philips Consumer Lifestyle (formerly Philips Consumer Electronics and Philips Domestic Appliances and Personal Care), Philips Healthcare (formerly Philips Medical Systems) and Philips Lighting. As of 2012 Philips was the largest manufacturer of lighting in the world measured by applicable revenues. In 2013, the company announced the sale of the bulk of its remaining consumer electronics operations to Japan's Funai Electric Co, but in October 2013, the deal to Funai Electric Co was broken off and the consumer electronics operations remain under Philips. 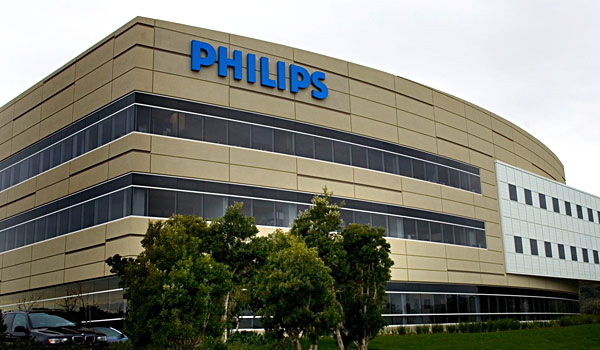 Philips said it would seek damages for breach of contract in the $200-million sale.